We have activated the Turnitin service and most new assignments will be submitted via this service for the distance classes (Pretoria). To test its efficiency your Human Evolution assignment was scanned and the reports will be sent to you individually. You should all have received an email subscribing you to Turnitin. If you have not received an email notification with the subject "Turnitin Account" please contact me directly at rknight@uwc.ac.za or leave a comment on this posting. In brief your assignments indicated that between 33% and 79% was not original work and in certain cases up to 36% of your assignments were identical to each other! Yes Turnitin also scans against each of your submitted assignments and hold these assignments in its database for future reference. 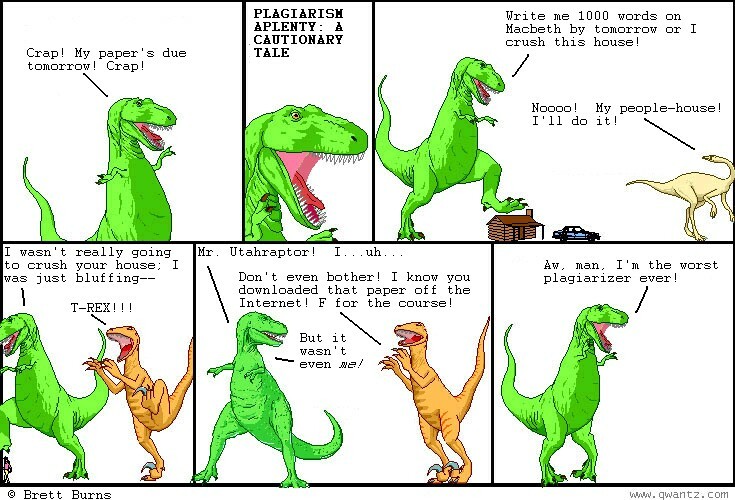 However, your assignments are not made available to sources outside UWC, so your intellectual rights are protected, but they are used to check for plagiarism by other Turnitin clients. If you use print material, it is quite possible that it is also in the Turnitin database, or students have previously plagiarised the text, in which case it is highlighted, but without me putting in a request for that assignment, I cannot say exactly what was plagiarised. The text in your Power Point projects for Science Methodology project will also be scanned and reports sent back to you in due course. Currently I will scan the documents for you and return them, not for correction but to inform you. Please stay tuned to this website and the others and uses your FeedBlitz subscriptions to ensure that you do not miss anything posted. We will provide links to instructions on submitting your work directly to Turnitin in a day or two.